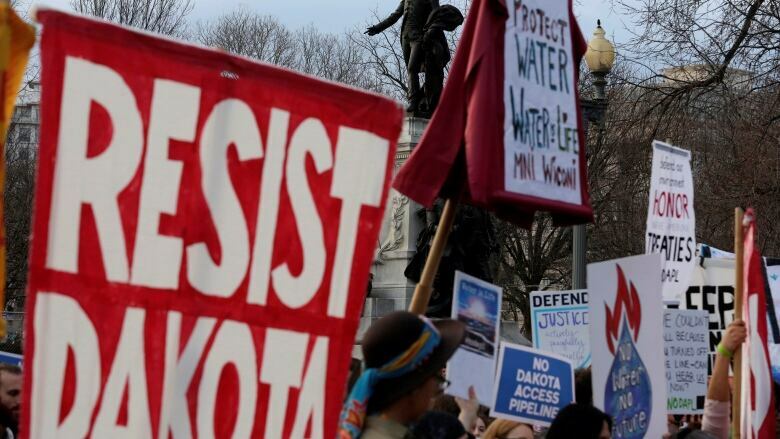 A U.S. federal judge on Monday rejected a request by two Native American tribes for an emergency order halting construction of the remaining section of the Dakota Access oil pipeline. A U.S. federal judge on Monday refused to stop construction on the last stretch of the Dakota Access pipeline, which is progressing much faster than expected and could be operational in as little as 30 days. The tribes requested the temporary injunction last week after Texas-based Energy Transfer Partners got federal permission to lay pipe under a Missouri River reservoir in North Dakota. That's the last big section of the $3.8 billion US pipeline, which would carry oil from North Dakota to Illinois. The tribes say the pipeline would endanger their cultural sites and water supply. They added a religious freedom component to their case last week by arguing that clean water is necessary to practice the Sioux religion. "The mere presence of the oil in the pipeline renders the water spiritually impure," said Nicole Ducheneaux, lawyer for the Cheyenne River Sioux tribe. But Boasberg said any immediate harm to the tribe "comes from when the spigots are turned on and the oil flows through the pipeline." Despite the setback, Native American activist Chase Iron Eyes said pipeline opponents will continue fighting the project in the courts and maintaining an on-the-ground presence in the drilling area, "in peaceful prayer and in dignity as we assert our rights to protect our environment, our economy and our sovereignty." It had been expected that the drilling work would take about two months and that the full pipeline system would be operational within three months. But David Debold, a lawyer for Dakota Access, said work is going more quickly and suggested the pipeline could be ready for oil in as soon as 30 days. "We're not in a position where we can agree to any kind of stopping of the pipeline," Debold said. Energy Transfer Partners received final approval from the Army last week to lay pipe under the reservoir and complete the 1,900-kilometres pipeline. Drilling work began immediately under Lake Oahe, which is the water source for both tribes. The company's attorneys filed court documents early Monday urging Boasberg to reject the tribes' request, calling the new religious freedom argument "exceedingly tardy," "not construction-related" and a "last-minute delay tactic." "Dakota Access has the greatest respect for the religious beliefs and traditions of (tribes). The emergency relief sought here simply is not necessary to protect the exercise of those beliefs or preserve those traditions," wrote William Scherman, a company attorney. The Corps also filed court documents Monday arguing that a work stoppage isn't warranted, saying the tribes will have plenty of time to make their case before oil flows through the pipeline. Work under Lake Oahe had been held up in the courts until President Donald Trump last month instructed the Army Corps of Engineers to advance construction. The army is involved because its engineering branch manages the river and its system of hydroelectric dams, which is owned by the federal government. Energy Transfer Partners maintains that the pipeline is safe and disputes that cultural sites have been affected. But an encampment near the construction in southern North Dakota drew thousands of protesters last year in support of the tribes, leading to occasional clashes with law enforcement and more than 700 arrests. The camp has thinned to fewer than 300 people, but law enforcement officers continue to maintain a presence in the area. The cost to taxpayers has reached $33 million, the state's Joint Information Center reported Monday.